I've spent the last few weeks doing something fairly extraordinary: I organized my workbench! Sifting thru the geologic layers I discovered that I had no less than seven projects in and around the area so I set myself the task of sorting it all out. When all was done I had them neatly arranged on the bench, from oldest on the left to newest on the right. Consulting my notes I saw that the oldest project had been malingering since November '02 when I had every intention of giving them away as Xmas presents!! Bottom line: I've decided that one's got to get done first, so I'm converting from metalworking to woodworking for a few weeks. The mess in question consists of several copies of a hand-crank kinematic representation of a Stephenson valve steam engine that I found in the fantastic book: "Making Mechanical Marvels in Wood" by Raymond Levy (currently out of print). I'll post photos of progress below, until I get the damned things done. Maybe I'll get to project number 2 of 7 next month?? Photo #1: Here's the first almost-completed unit. Note pen for scale reference. The cylinder is the single most massive component and I made it by gluing up two 1" thick planks of Mahogany. Pushrods, Pivots and shafts are made from several sizes of store-bought dowel; pins are cut from round toothpicks. The eccentric is Lignum Vitae and the eccentric strap is Purpleheart. 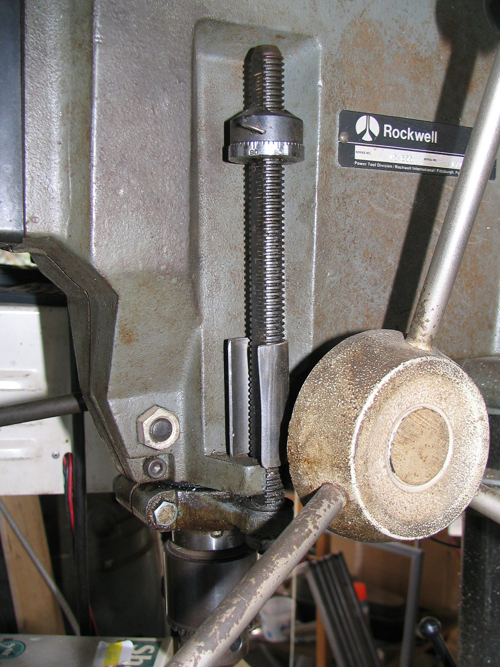 The connecting rod is Lacewood (turns out I'm allergic!). It's been so long I don't remember what I used to make the con rod trunk guides, but it's a chocolate brown wood with lighter bands, similar to Zebrawood but with a less pronounced color difference. 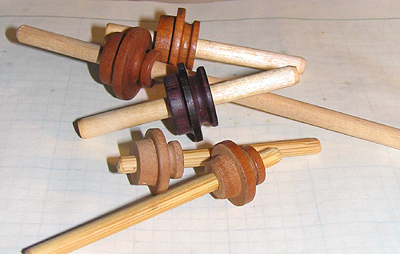 The problems at hand are the packing glands, which I've turned from a variety of woods using a metal lathe. Photo #2: A variety of homemade dowel that I'm trying out, to make the packing glands and valve covers. From back to front: Purpleheart (note split bushing to hold it securely in a metal lathe chuck), Oak (dreadful stuff), Birch, Cherry and Mahogany. Photo #3: A variety of packing glands that I've turned on my metal lathe. 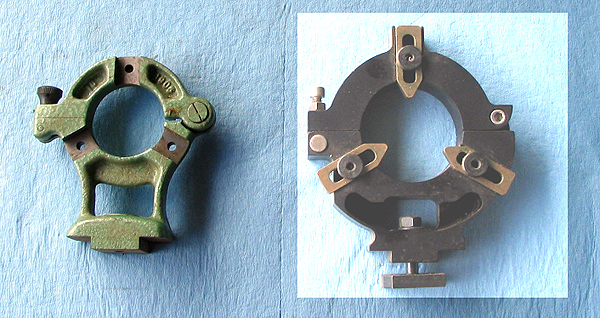 The three piston rod glands to the rear are 1" dia and the two valve rod glands in the foreground are 3/4" dia. 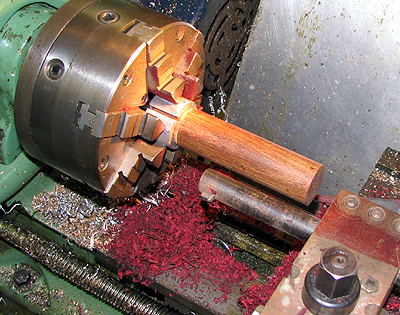 Photo #4: First attempt to make a packing gland with Purpleheart was less than fantastic: I used the only tool I had; i.e. the wrong one and I chipped the thing so badly I had to start over. Rather than screw up more good wood I decided to practice a bit more on the messed up section and managed to achieve a tolerable curve. 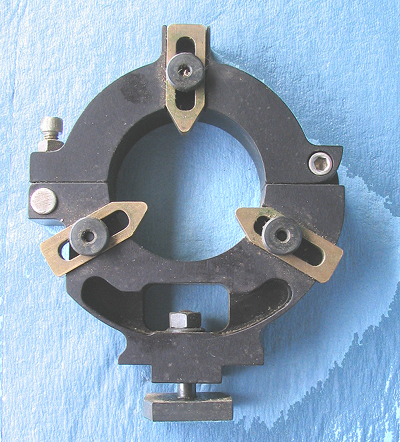 I've since bought a nice 1/8" wide tool with proper geometry and a good grind; I'll take another whack at packing glands tonight, after I make a proper tool rest. Once I master turning these little guys by hand I'll want to concentrate on how to achieve a really smooth surface. That's the next puzzle: I managed to achieve a smooth enough finish when turning the Purpleheart with metalworking tools, so I started sanding with #320 grit sandpaper, but this was definitely too fine. Must remember to start with #220 next time. After finish is decent there's the matter of maintaining the wonderful color and luster of the Purpleheart. Not sure what an adequate finish is for the stuff so I'm asking one and all for advice on this topic. All you expert turners out there please give me a holler if you've been down this road before.